A charity auction to support Children's Mercy Hospitals new Guest Services department will be held December 5th, First Fridays, from 6-8pm at the WISE gallery in VML, 202 Baltimore. Several KCAI Illustration students and faculty are participating in the event, come out and show your support! As the resident artist for Children's Mercy Hospital, local Kansas City muralist Donald Ross Scribe has been pioneering the Hearts Social Club charity event over the past several months. 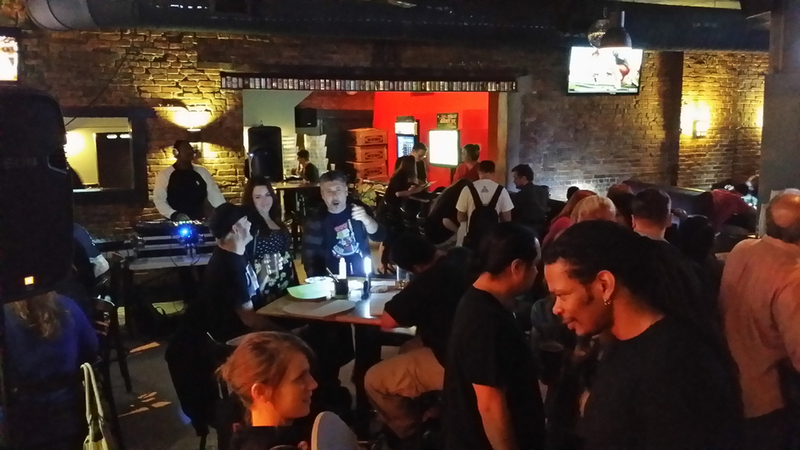 The project humbly began as a drive to bring local artists of all levels together in a fun and casual creative event, dubbed "Drink and Draws," and quickly grew into a fully fledged and ambitions charity art auction. The project features over 200 wooden hearts cut by local shop Sign Connection, many of which were donated to the cause, which were then distributed to participating artists at monthly Drink and Draws at Town Tavern. Why the heart shape? 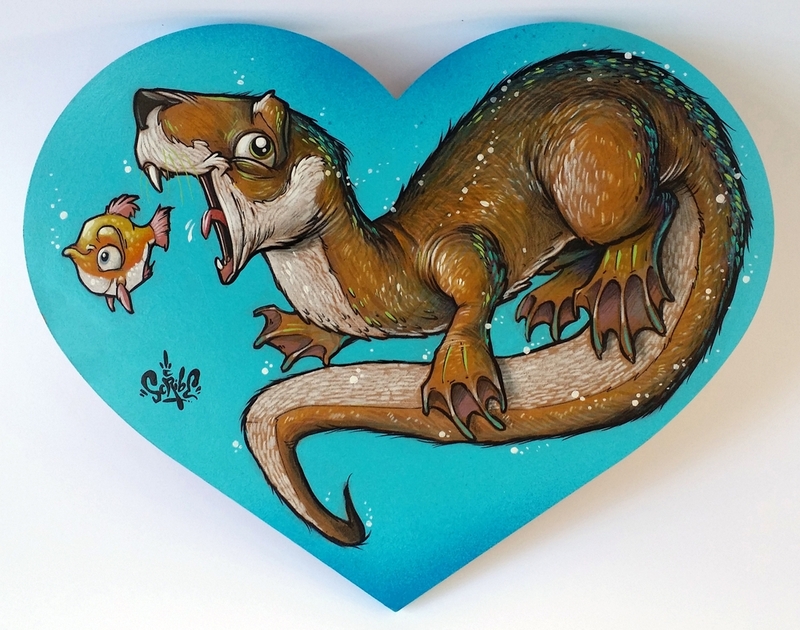 As Scribe puts it, "its a tie in between where this art is going to come from... the heART." Several KCAI Illustration students are participating in the event, namely seniors Kelsey Wroten, Kelsey Borcherding, and Rosie Ruzicka as well as instructor Hector Casanova. The brain child behind the fundraising is the push for a new "Guest Services" department at Children's Mercy, which in conception would take care of visitors needs when caught off guard with the challenges they may face when being a guest at a hospital. It would be about getting patients what they need in order to make people feel more at home during a stressful time. Though Children's Mercy is blessed with many donors, they expressed a need for start-up costs in order to get things moving and thus the idea was born. Many local companies have noticed the efforts of the Hearts Social Club and have come together to help meet the needs of the event. VML will be hosting the auction at their downtown WISE gallery, Blick art supplies at Main Street donated supplies directly to the artists at Drink and Draw events, Children's Mercy employees and volunteers have offered to help manage the auction, and many other companies have come forward to offer their support. Scribe would also like to thank the many people involved behind the scenes, his wife, Alisa Ross, Max Ross, Joc Max, Missy Stover, Kevin Lee, Megan Stock, Lisa Take and John Mulvihill and his support staff at VML, The Tower Tavern, Blick Art Supplies, Sign Connection and Poster Worx and most importantly all the artists and their works. Already his third heart submission! One of many hearts Scribe himself has completed. Everyone loves to Drink and Draw! One of the several events held at Town Tavern over the past several months. 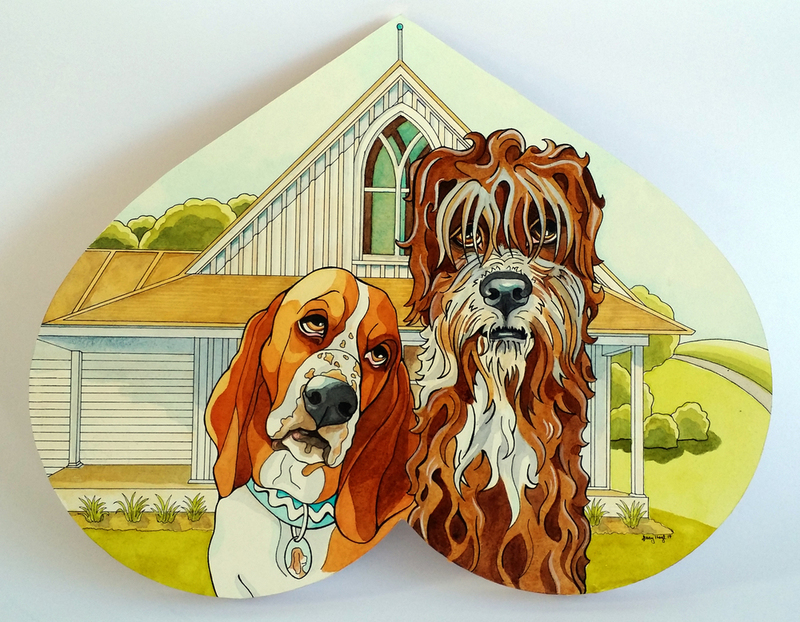 Local Kansas City illustrator and muralist. 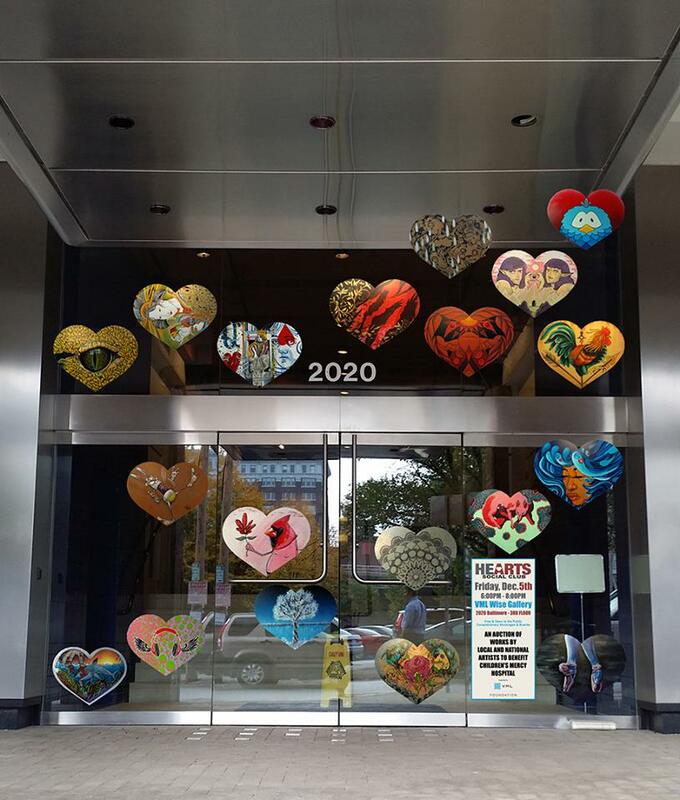 VML has printed many of the unique heart designs and hung them in their doorway to promote the event! Lookin' great! Another sample of the creativity and variety of the artists! Just a sample of the many many hearts that came home last Wednesday at the turn-in event. The event is open to the public and Children's Mercy will be there to accept the bid money via cash or credit card. 100% of the proceeds will go to Guest Services at CMH. Donations on the hearts will start at $50 and will be capped at $100, a move which Scribe believes will level the playing field and allow art collectors of all levels and ambitions a shot at a a piece. Scribe is already planning the next Hearts Social events and envisions a once a year revival and many more artistically focused events to come.